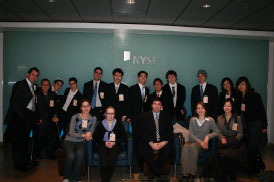 A Financial Literacy Program at the New York Stock Exchange - The Eve Fenton Love-All Foundation, Inc.
On March 3rd 2009 the Eve Fenton foundation ran the latest of several Financial Literacy events at the New York Stock Exchange. This program was put together by Mr. Daniel Kamelhar to help enhance financial literacy to college students. The program consisted of 20 college students and a small group of high school seniors. This program was geared at teaching college students some of the different financial products available. Products discussed were such savings plans as 401K, 403B, CD’s, Money Market accounts and checking accounts. Many of the students knew of some products, but none knew of all. The program started out with an open discussion as to why did these students take time out of their busy life to attend. Answers ranged from “it’s an experience to see the NYSE”, “being afraid of today’s economy and feeling the more information about moneyand finance the better shape I am in” and one student saying “I want to see what kind of profession (stock broker) I once dreamed about becoming but have now lost faith in the that field of work”. Most of the student’s were pessimistic, but our job was to make the students understand that a lot of what is happening in today’s economy is because of lack of financial knowledge in previous generations. Our goal was to teach the students to learn from other people’s mistakes and grow stronger. The program continued with a speech from Mr. Steve Wheeler who is the Educational Director at the NYSE. He told the students that there is a more to finance then just stocks. He briefly touched on bonds, options, commodities and treasuries. This was followed by a workshop on savings by Mr. Bill Dobrow from Ameriprise who showed students that are so many different types of ways to save money for the future. “Even if you don’t have a lot of money you can put a little aside each week or month and at your age let it grow and compound slowly and safely”. Many students did not understand the concept of compound interest. One of the strongest things focused on that day was the difference between Rates vs. Yields. As the program winded down we were able go to the NYSE observation deck and watch the closing bell. It was loud, it was fast, and it was exciting. Students have only seen this on TV, never before in person. Before we exited the building Bob Pisani from CNBC came out after the closing bell and gave us a brief overview of the world’s economy from an anchor’s perspective. As he was finishing up he told our group that the more financial understanding today’s young adults have, the better it is for us prevent future problems in the world’s financial economy.